Sujay Deb is an Associate Professor in Electronics and Communication Engineering at Indraprastha Institute of Information Technology, Delhi (IIIT-D). He received PhD from the School of Electrical Engineering and Computer Science, Washington State University, Pullman, WA on May 2012. Before his current position, he worked as an intern at Intel Labs, Hillsboro, OR. 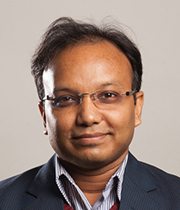 His major awards and achievements include DST INSPIRE Faculty award in 2012; Outstanding PhD student award in Computer Engineering, WSU, 2011; Winner of India-US Grand Challenge Initiative for Affordable Blood Pressure measurement technologies in 2014. Digital VLSI Design, SoC Design and Test, Integrated Electronics.